Found one file extension association related to EasyLog and 1 file format developed specifically for use with EasyLog. 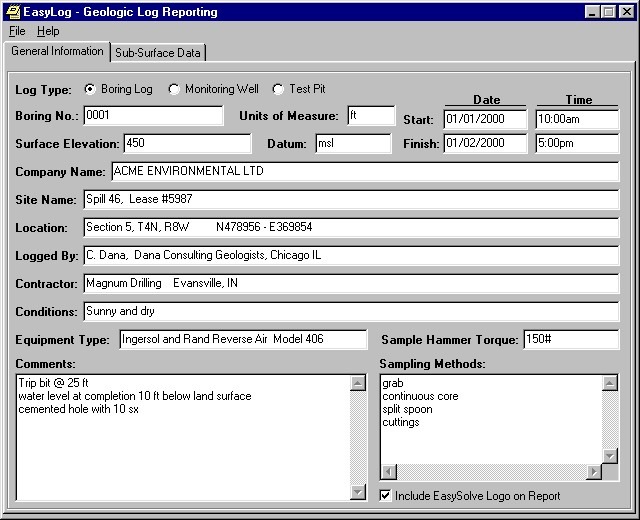 EasyLog is designed to be used by professionals in environmental science, mining, petroleum, and geotechnical fields. EasyLog combines, in one program, the ability to log borings, test pits, and to diagram monitoring wells. Aside from maps and chemical analysis, these represent the major attachments to most professional geological or engineering reports. If you need more information please contact the developers of EasyLog (EasySolve Software), or check out their product website.